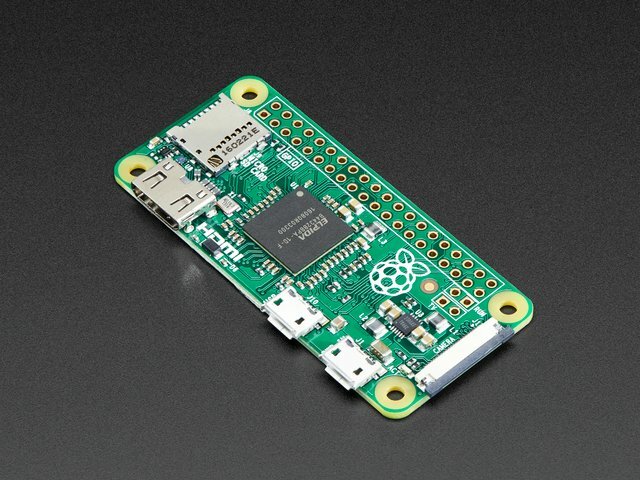 Before mounting the components, go ahead and plug in the micro USB OTG adapter to the Raspberry Pi. OK, now is a great time to test the circuit. 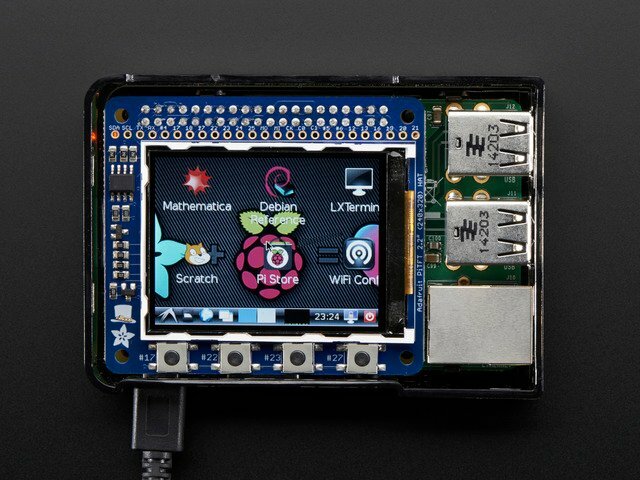 Make sure the PiGRRL Zero IMG has been properly burnt to the SD card and inserted into the Raspberry Pi. "Flip" the switch and the PiTFT should turn on. The Pi will take about a minute to boot up. The controls are premapped so you can test the gamepad PCBs. Try a play test with one of the games in the PORTS section. Use the "A" button to select. To exit a game, hold down the two middle buttons (select and start) on the PiTFT. 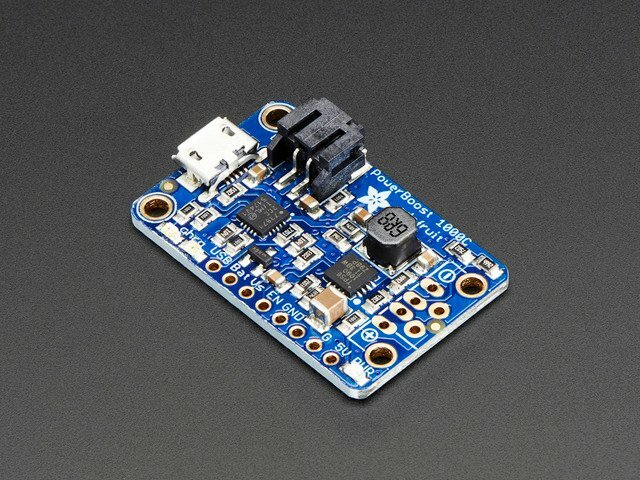 If you find something off or doesn't work as expected, feel free to post your questions or concerns in the Adafruit Forums. If everything works as expected, feel free to move onto the final steps! Let's start with the PowerBoost. This is mounted to the bottom half of the enclosure, near the bottom right. The microUSB port should be pointing towards the opening. Simply lay the PCB over the standoffs and press it down so the pegs are seated into the mounting holes. The slide switch can be installed into the bottom half of the case by inserting it at an angle. 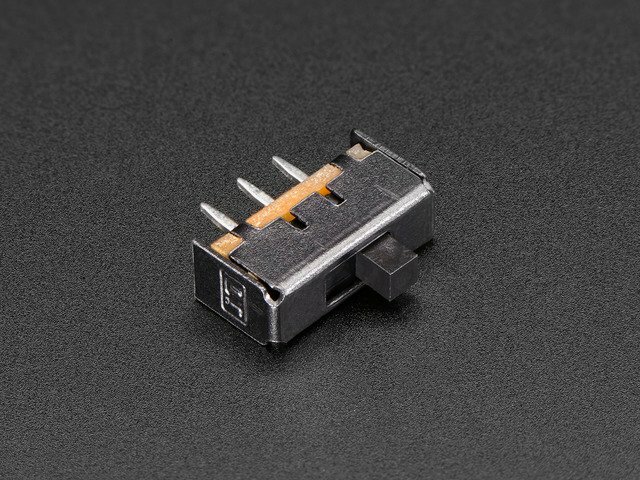 Similar to the slide switch, you'll need to insert the female USB jack at an angle. 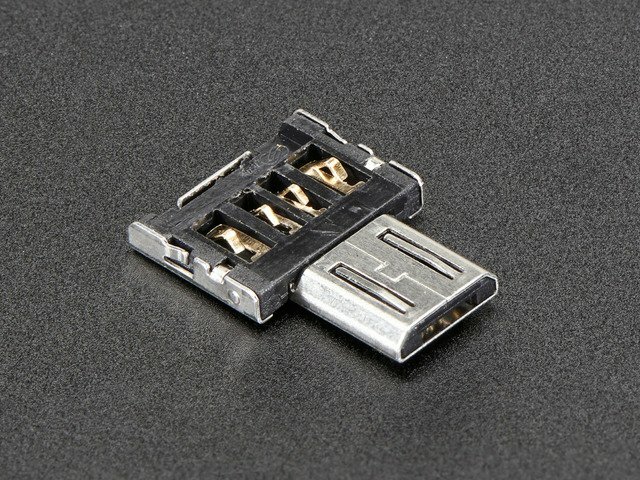 A slight amount of force is required to snap fit the housing of the USB jack into the opening. 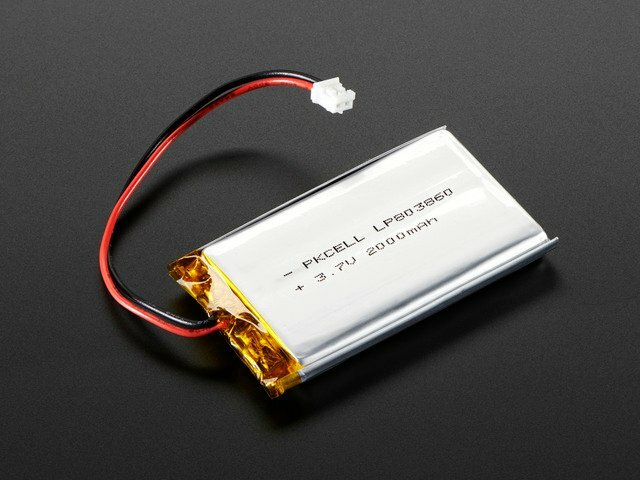 There isn't a dedicated "holder" for the battery, but a good location for the battery is near the top center. I suggest using either double-sided tape or mounting tack to keep the battery in place. We'll need two #4-40 3/8 flat Phillips machine screws to install the PiTFT to the case. 3D printed washers will help prevent the screws from poke through the enclosure. 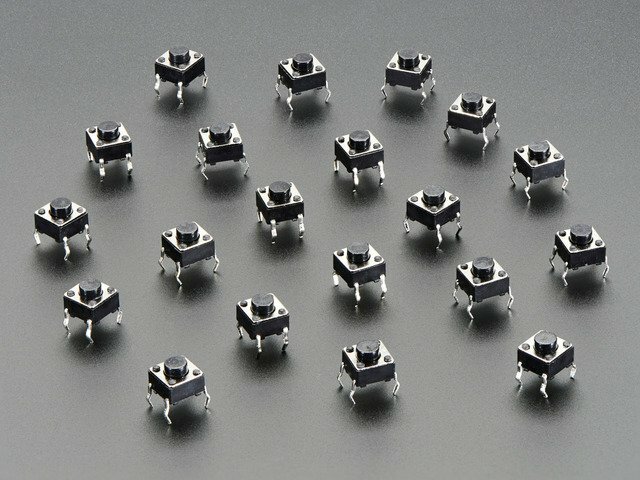 Fasten each screw into these washers. Grab the top half of the enclosure and insert the DPad, action buttons and 4-grouped menu buttons. Position the full circuit into the top half of the case. Line up the mounting holes of the PiTFT with the standoffs in the center of the case. Insert one machine screw into one of the bottom mounting holes of the PiTFT. Hold the PCB down to the case while fastening the screw through the PCB and standoff until the washer is flush with the surface. Repeat for the second machine screw. There's two mounting holes on each gamepad PCB needs to be tapped. Using a #4-40 machine screw, you can create the threads by slowly fastening through the hole. I suggest doing this before mounting the PCB to the stand offs on the case - It'll make it easier. With the mounting holes tapped, position the PCB over the standoffs on the case and hold it in place. Then, fasten screws through the mounting holes. Do not fully fasten the screws into the standoffs – They only need to be fastened half way. The screw may poke through the case if it's fully fasten through. A small piece of mouting tack will keep the shoulder buttons in place. Near the top of the gamepad standoffs is a holder for the shoulder buttons. Insert the shoulder button into the holder with the actuator pointing towards the top. Now is a good time to check all of your work. Are all of the wires connected? Are all the components secured? If you find some of the wires are too long, it's fine to trim them short. Carefully join the two halves of the case and press them firmly together. Ensure all of the wires are inside the enclosure to prevent kinking any of the wires. The shoulder buttons printed in TPE filament is easy to install. Squeeze the actuator and press it into the openings. Hold the two halves together while installing the actuators to prevent the case from coming apart. Congratulations! 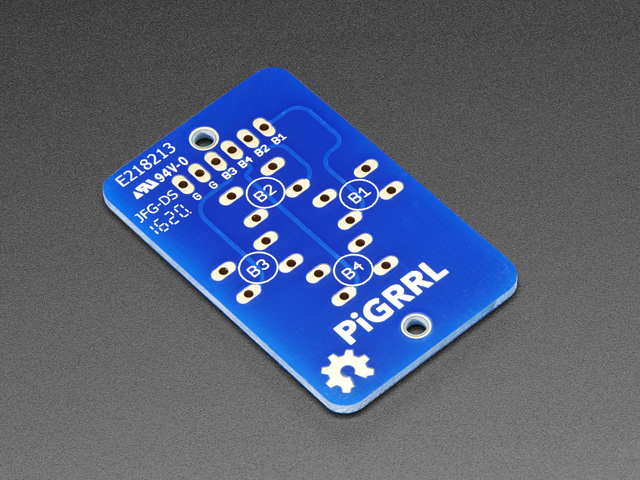 You've finished building the PiGRRL Zero! Take a moment to test out all of the button acutators with a play test. If eveything works as expect, great! If not, please feel free to post any questions or concerns in the Adafruit Forums. This guide was first published on May 06, 2016. It was last updated on May 06, 2016. This page (Mounting Components) was last updated on Apr 17, 2019.